If you want to read more about cosmic fine-tuning, one of the best short books is 'Just Six Numbers: the deep forces that shape the universe,' by Martin Rees. 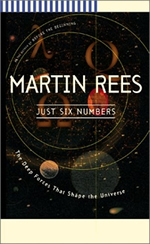 Rees discusses the six numbers of the title that contribute to a life-supporting universe: the ratio of the strength of electrical forces to the force of gravity; the strength with which atomic nuclei bind together; the density of the universe; the cosmological repulsion constant; the amount of unevenness in the big bang; and the number of spatial dimensions. He argues that if any of these numbers were much different from what they actually are, life would be impossible. So he simply does not engage with the possibility that the fine-tuning points towards a Creator. However, Rees is an excellent communicator, and as a short account of the physics and cosmology involved, this book is hard to beat. Martin Rees is the Astronomer Royal, Master of Trinity College, Cambridge, and Baron Rees of Ludlow.